Greek Football – A Tale of One City? Olympiacos and Panathinaikos: two Champions League regulars we all have at least a bit of familiarity with. Champions League group stage perennial drop outs, they are the shop window of Greek football to the rest of Europe: in fact with the possible exception of AEK Athens, what does the rest of the world actually know about the Greek Superleague? Few domestic leagues are so dominated by two sides from across the same city. Fans of Scottish football are probably fairly familiar with the Greek set-up, but historically the Old Firm don’t have quite the stranglehold on their national game in the same way that the Eternal Enemies do. This year the dominance of the big two has been broken in spectacular fashion and a casual glance shows a fantastic shake up of the establishment. A closer look show that there are more shades of grey to the story. 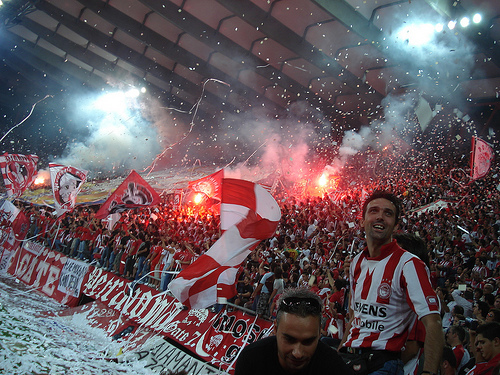 If the port region of Piraeus is considered to be part of Athens – perhaps a little contentious if you are an Olympiacos fan, but forgive me for simplicity’s sake – then the capital has won the Greek top division a staggering 70 times compared to just 6 occasions when it has not. The traditional “big three” has long since been cut to two, with the last of AEK’s 11 titles being won in 1994. The last 20 years of Greek football has been all about Olympiacos and Panathinaikos, and with the Reds on course for an easy 15th title in 17 seasons the league is seriously in danger of reducing its inner ring from two teams to one. If finishing third place has become an achievement in itself for the rest of the league, we all must applaud Asteras Tripoli FC for doing one better and reaching the dizzying heights of second. In a league so centralized around the capital city, Asteras have been a breath of fresh air and a true fairytale story. Playing football in their local league in the fifth tier of Greek football as recently as 2003, consecutive promotions saw them reach the Superleague for the first time in 2007 and survive with impressive mid-table finishes the last five seasons. Prior to this, the club had only ever spent three seasons playing within a professional league in the entire 82 year history. Despite these unfavourable odds, Asteras sit second, a full 12 points ahead of super-club Panathinaikos, languishing in seventh. In a year where the only real competition will be over the derby results and not the title itself, the plight of these underdogs is the story of the season. The question is which is better for Greek football: an upset to the established order and emergence of new teams at the expense of the title race, or a climactic title race between the usual suspects? The cost of this surprise usurpation of the order has been that Olympiacos have a 13 point lead atop the table, with a game in hand and mighty plus 32 goal difference reflecting not only the free scoring results but also the meanness of a defence that has conceded only 10 goals. Unless they were to capitulate and Asteras somehow win an unlikely first championship, the league’s two team dominance appears to have worsened. One argument might be that the breaking of the Athenian stranglehold is a good thing, but the counter is that it has been concentrated even more so in the hands of one team and not two. While it seems counter-intuitive, Panathinaikos’ problems this year have if anything made Greek football less meritocratic. Greek football culture is totally built around this dynamic. It’s more in the line of the Spanish model than the English: yes, you support your local team, but everyone in Greece is either red or green on derby day. Greece needs a strong Panathinaikos to create competition in the league because the simple truth is that teams like Asteras have virtually no chance of winning the title themselves. That should take nothing away from the remarkable achievements of the Tripoli based side and no blame can be placed on them for the lack of a title race this year. 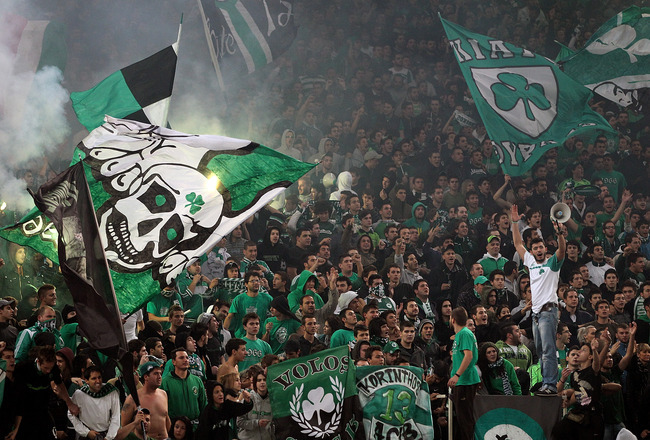 If we are pointing fingers, the Athenian ultras of Panathinaikos are certainly in the spotlight. The controversial Gate 13 group, largely involved in wider riots related to the government and police response to the economic crises, used the March 2012 ‘Derby of Eternal Enemies’ to stage a mass riot against police involving part of the stadium set ablaze and hundreds of supporters attacking the riot police. In response to this, the club was sent into turmoil. With the playing squad depleted through fire sales to stave off the possibility of administration, the entirety of the board quit and left Panathinaikos headless for a full two days before in July majority shareholder Giannis Vardinogiannis generously gave his shares to the fans in exchange for their financing of the club on a donation basis. With 55% of Panathinaikos now fan-owned the future may be bright in the long term but the political instability has had a terrible effect on playing standards even though much of the squad remains. Think of a scenario in which Venky’s own Manchester United and you’re some way towards imagining how things have been running at the Olympic Stadium. The two point penalty for rioting has been a drop in the ocean compared to self inflicted back room issues, and loss of key players like Djibril Cisse has compounded the problem on the pitch. A healthy Panathinaikos will only improve the league. Certainly the club deserve no sympathy, least of all the young and violent Gate 13 ultras, and in an ideal world they could happily reside mid-table without it ruining Greek football: the problem is that in their absence there is no other competition and the monopoly that Athens holds over the sport prevents other clubs from competing economically for players, culturally for support or sportingly for trophies. It says much about the game that there is no Hibs, Inverness or Motherwell to fight for second, only a team with more in common with Montrose or Peterhead. Despite Tripoli’s efforts, whether it is dominated by one or two clubs, Greek football will be for the foreseeable future a tale of one city. This entry was posted in Analysis and opinion and tagged AEK Athens, asteras tripoli, athens, Derby of Eternal Enemies, Djibril Cisse, Eternal Enemies, gate 13, Giannis Vardinogiannis, greece, greek football, greek superleague, olympiacos, panathinaikos, superleague greece by Simon Smith. Bookmark the permalink.